Blog Quick Quotes: Off the Page with Alicia! Off the Page with Alicia! Good morning Quick Quotes' readers, Alicia here today with an altered project for you today. I must admit this project has been in the works for some time. But when I received the new Quick Quotes Winter Bliss collection, I was finally able to accomplish the project I envisioned. My nephew's room has arrow accents and it blue and gray. The new Winter Bliss blue arrow paper was just perfect to cover the chipboard letter. I distressed it with Coal Miner PowderPuff Chalking Ink and some stencils including the Want2Scrap Brick stencil. I also used some texture paste with a stencil or two to give the project some dimension. I also added plenty of arrows, some metal and some cut with templates. I also cut some other shapes out of the Winter Bliss papers and added various embellishments. I also created a chipboard frame on the letter. 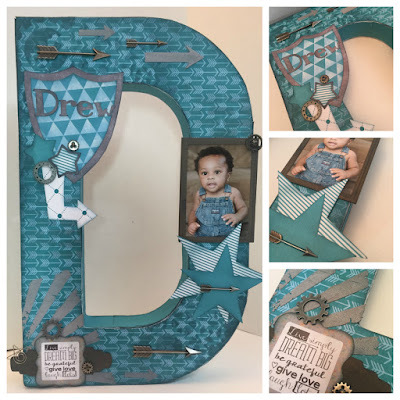 I die cut the frame with nesting dies, chalked it up with Coal Miner PowderPuff Chalking Ink, then attached the frame to a chipboard backing. Once I cut the picture down to fit, I measured and wrote the dimensions inside the frame so my sister in law can replace the photo as she sees likes.